Heat & Grill is an independent BBQ and outdoor living retailer based in Richmond, Victoria. They are a Weber Specialist dealer and carry a large range of BBQs, outdoor furniture, umbrellas, heating, and cooking accessories. Brand Solutions work together with the Heat & Grill sales team and management to understand their requirements for both end-user customers and their internal team. Our creative team concentrate on delivering consistent dynamic designs while our digital marketing experts are continually looking at ways to improve brand visibility with conversion rate optimisation strategies and targeted campaigns to boost the bottom line! We built a consumer focussed e-commerce website which shows off the Heat & Grill brand and the full collection of products for sale online and in-store. User experience is priority and the use of iconology to assist navigation throughout the site is desirable. 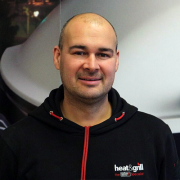 The Heat & Grill sales staff must also be able to manage orders and enquiries through the website. Our digital media responsibilities also extend to driving traffic to the website through targeted gogle adwords campaigns and creating a Social Media presence that continually engages with the Heat & Grill audience. We have been working with the Heat & Grill brand for over five years and really know their DNA. We regularly work with their sales team to create product-focussed and eye-catching advertisements and print media which will be distributed to Melbourne’s inner and inner south-east regions. Brand Solutions have delivered a professional, engaging website and supporting social media and print collateral which have become a major part of the marketing campaigns for product launches and promotions. These campaigns have been immediately successful in contributing to online sales of merchandise and the ongoing engagement of online users. Heat & Grill’s Facebook page continues to grow with over 2.3k likes and positive reviews averaging 4.7 out of 5 (as of August 2018). Through targeted Facebook campaigns and eDMs, Heat & Grill are also able to sell out their exclusive Cooking Masterclass events each time it is run.